Happy Easter everyone! I hope you are all enjoying this beautiful Sunday morning! Today we celebrate Christ’s victory over the grave, and there is nothing more precious than this wonderful truth! A while back I ask everyone about your family traditions. You all had some very fun and meaningful ones. Resurrection eggs and cookies were at the top of the list. While there were some other fun ones like fishing and reading Easter stories together. 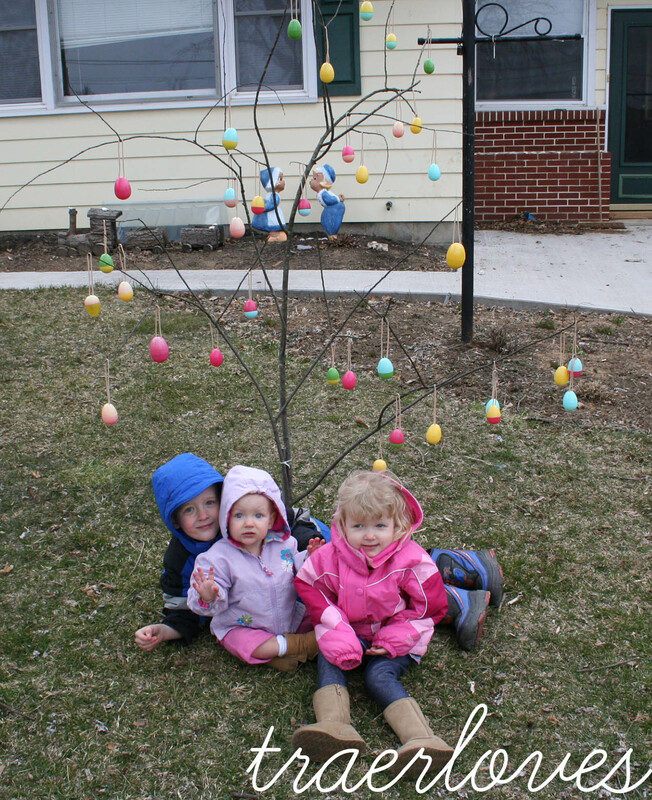 One of my friends, Sarah Baughman has an unusual tradition of hunting for a bare tree (stick) with her family and bringing it home to decorate with eggs. This shows how we are all lost and then found again by Christ and decorated with His glory by his victory on the cross! What a wonderful tradition Sarah is continuing for her childhood and passing on to her children. They are pictured underneath the tree! I pray everyone has a wonderful day full of friends and family and praise for the One who has conquered death and gave us new life!